Go Light! Know where the water sources are. "Thanks for working so hard to make sure hikers and equestrians have the best information possible"
"Wow, these are really cool!" our 400 miles of the PCT. and weighs about five oz. "it is mostly a recompilation of information found in the Wilderness Press guidebook, including the errors (which suggests the field checking was incomplete). Many of the water sources were missed. Moderate quality, but very expensive"
These maps supersede Jeffrey Schaffer's PCT maps in the Wilderness Press guidebook. Jeffrey was the first to map the trail in detail, did it before there was gps, and had only the roughest of USFS maps to go by. It is with greatest respect we dedicate these maps to him. He showed us the way. The trail always needs work. The PCTA will welcome you, IF you work under their supervision. They get paid by the Forest Service based on the number of hours you work, but for some of us that defeats the purpose for being a volunteer (i.e., to do something good at no cost for our country). The PCTA is good for beginners who need training and guidance. We have found the PCTA unfriendly to independent groups. The Congress has directed the Forest Service to be encouraging to volunteers, but we have found them not to be. Ignored applications, arbitrary termination of agreements, etc. Try your local Ranger District and they may be helpful. If that doesn't work, ask your local congressman's office to provide backup. If you establish a good relationship with the local rangers, this can be an effective way to go. When we maintained the PCT under agreements with the Forest Service, we observed much maintenance had been done by people without official approval. We appreciated it, but there are federal regulations against it, so do so at your own risk. In our area, probably more trail maintenance is done this way than by official crews, especially on the secondary trails. Without their efforts, more National Forest system trails would have been lost due to lack of maintenance. 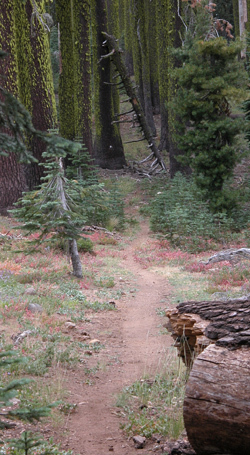 These "map[s] of the PCT [are] fully functional for trip planning and navigation"
We disagree. We think it is dangerous to hike the PCT with such large scale (lack of detail) maps. It will be hard to find the PCT at the un-signed cross trails. These are substandard as hiking maps.